Authentication in detail. Introducing IA Server and the concept of a shared security environment. We have learned the foundations of identity management (including user accounts and claims), and authentication. This week, we will look again at the authentication process. Then, we will be able to design a system that will enable scale and flexibility, to support multiple apps that share the same security environment. Test 3 is today, at the beginning of the timeslot. It covers security topics, mostly from weeks 7 and 8, and some of this week’s topics (up to and including the section titled “Understanding more about the authentication process”). The test is worth 13%. After the test, we will cover the highlights of this week’s new topics. If all this works, then (as stated above) a ClaimsPrincipal object is created, using the user account and claims data that is found in the cookie/token. 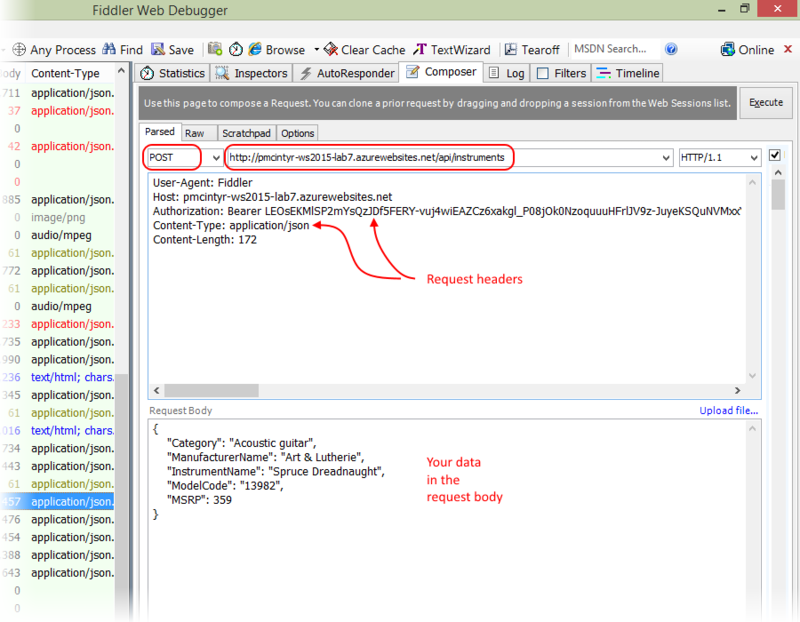 The object is then attached to the request thread, and functions that happen later in the request-processing pipeline can query the security principal and perform authorization tasks. Remember to study and use this week’s code examples. In the previous class/session, you learned many things about the process of authentication, and cookie or token validation. While related, they are separate and distinct processes. After thinking more about these processes, one could conclude that it is possible to split the authentication process – credential validation, and cookie/token validation – into separate apps. This would enable us to have an app dedicated only to identity management and authentication (the credential validation part). Additionally, we could create more apps that could use the services of the identity management and authentication server. This enables us to create a portfolio of apps that share the same security environment. IA Server is intended to be used with another app. IA Server will take care of identity management and authentication, so you do not have to add those features to the other app. When you are programming and testing your app, you will have two instances of Visual Studio running. One will have (and run) the IA Server, and the other will have (and run) your app. Therefore, both will be running on your computer’s localhost instance of the IIS Express web server. As discussed earlier, the encryption and decryption process for cookies or access tokens uses a “machine key”, which is a secret and cryptographically unique value, that is created when the server operating system is installed, and is then securely stored by the operating system. The access token issuer – which is the IA Server app – uses the machine key to encrypt the access token. Then, the access token validator – which is your app – uses the same machine key to decrypt the access token. Both apps are running on the same computer, so they will be using the same machine key. It all works fine. However, when you deploy the IA Server app and your other app to a real public web host (e.g. Azure), they will likely end up being deployed to different computers (or virtual machines). What will happen then? Your app will not work. Why? The machine keys – on different computers (or virtual machines) will not match. Then, in the IA Server, and in each app that will share the same security environment, add this as the last entry in the system.web element of the app’s Web.config source code file. Please note that this gets a little more complicated in an environment with different frameworks and operating systems. While the principles learned in this course can be used to make a more complex environment work, that topic treatment is beyond the scope of this course. Before moving on, we urge you to dedicate the IA Server to identity management and authentication (cookie/token issuing) only. Please do not add any app domain logic to the IA Server. A security system – like our ASP.NET Identity system – includes identity management, authentication, and authorization. The authentication process is divided into two distinct sub-tasks, 1) credential validation, and 2) cookie/token validation. The IA Server is an app that includes identity management, and the credential validation part of authentication. So… how can we ensure that one of our web service apps is configured with the access token validation and authorization parts? That leaves access token validation. How can we add that? Continue reading below. Before continuing, make sure that your project does NOT already use a security environment. In other words, the app’s project template must NOT use any of the authentication settings (e.g. “Individual User Accounts”). The web service project template can be used, because it includes a ready-to-use data-rich environment (the Chinook sample database), but it is NOT configured for a security environment. Using the procedure that you learned above, generate a new machine key, by using the IA Server app. Then, add it to that IA Server app, and to your app. At this point in time, your app will be able to perform access token validation. As a result, whenever you use the [Authorize] attribute in your controllers (or use any other code that accesses the security principal), the app will be able to make authorization decisions. As noted earlier, when you are working with a separated apps (IA Server and your app), each app’s project is loaded in Visual Studio. That means you have two instances of Visual Studio running. Then, you run/execute the apps. Each will be configured on its own customized TCP port, and run on your computer’s IIS Express developer web server. Yes, you still interact with your apps using Fiddler. The image below shows a typical GET request that includes a token. 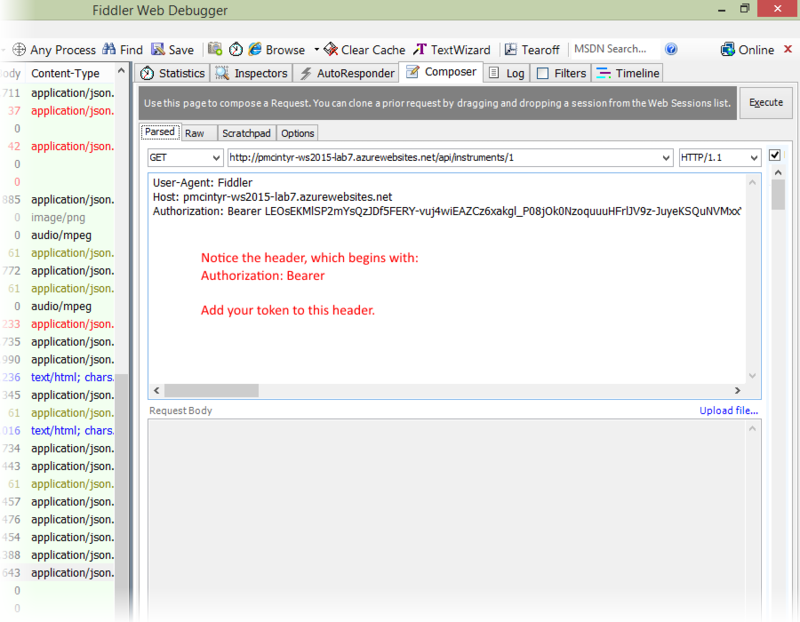 The request needs an “Authorization” request header, in addition to whatever else gets configured. Click to open it full-size in a new tab/window. The image below shows a typical POST request that includes a token. The request needs an “Authorization” request header, in addition to whatever else gets configured. Today, we learned that the authentication process has two distinct sub-tasks, each of which can be done in separated apps. Finally, we learned more about separated apps, including a dedicated and sharable identity management and authentication (issuer) server, and an app that can use a shared security environment. Work on the next assignment.